Satisfaction isn't enough - I'm here to Exceed your Expectations! With unmatched attention to detail and unparalleled reliability, Ilana Rosenbloom has been described by clients as a consummate professional who is cheerful, friendly and straightforward in her dealings. Real estate excites Ilana! She believes each home and building has an appeal, and she has a knack for finding it. 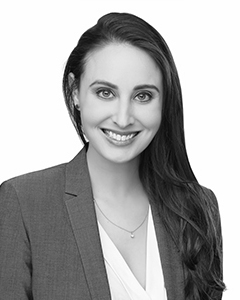 Ilana started her real estate career in Leasing and Property Management for some of the nation's most competitive and esteemed development and management companies. Within just her first couple of weeks in the business, she quickly outshined other “ more seasoned “ agents by winning a best sales pitch competition, and by leasing out some of the community's most difficult sells; including multiple penthouses and units deemed less desirable due to their proximities near to the Metra tracks. Known to be extraordinarily organized and thorough, Ilana works efficiently in fast-paced environments. Others also describe her as a top-notch interpersonal communicator; she not only communicates effectively with others, but she also genuinely enjoys forming relationships. Most pertinent, Ilana has the drive to close a deal! Ilana graduated from Michigan State University with high honors, a bachelor's degree in communication, and a specialization in public relations. She then moved to Chicago and spent 5 years living in the Gold Coast. Ilana now resides in the West Loop, and loves to decompress at the local cycling studios. "I moved to Chicago from out of state and let me tell you...Ilana was the best. She understood that I had limited time and didn't waste a single second of it. She also is very prompt, courteous, knowledgeable about Chicago and follows up on everything. Would love to work with her in the future!" "Not only were we first time home buyers which can be overwhelming in itself, but we were still living in Maryland as we searched for our home in Chicago. Ilana was always extremely efficient, focused and organized when we would come to town just for a few days at a time to look at properties. She was always on it! Ilana was also patient with us as we explored every neighborhood of Chicago. She was able to help us narrow down neighborhoods that best fit our lifestyle. She knew us as buyers & knew the market very well. We felt comfortable and trusted her guidance. Finally when we found the one, she quickly referred us to an attorney and inspector - both who did such a great job! Ilana's dedication & patience really made us feel comfortable every step of the way and our contract could not have closed any smoother." "Ilana was a true professional! I enjoyed working with Ilana for many reasons. First, I felt like she really understood my needs and wants and translated that very well into the search process. As a first time home buyer, I really appreciated how easy & simple Ilana broke down the process each step of the way. Ilana was very responsive via text & email and made sure to be prompt with follow ups. I truly believe that Ilana had my best interests at heart which became pretty evident through her honesty & integrity. I highly recommend Ilana to anyone looking for a realtor. She will do a great job!" "Ilana was so helpful and professional from start to finish. She made the home-buying process much easier than I anticipated. My family loved her as well. I cannot recommend her more highly." "Ilana is the best! She was extremely helpful throughout the process, which I especially appreciated as a first time home buyer. She kept track of details meticulously and went above and beyond at every stage of the process, providing guidance and knowing where to turn for expertise. I have already and will continue to recommend her to friends and family!"